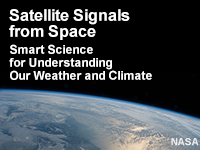 Want to know about COSMIC, and how satellite signals can provide information about Earth's atmosphere? This video provides anyone interested in the topic with a brief overview of the Constellation Observing System for Meteorology, Ionosphere, and Climate, called COSMIC. Targeted to students and teachers in Grades 5-9 but accessible to anyone, the video introduces the latest COSMIC mission (COSMIC-2), which uses satellites orbiting near Earth to measure how the atmosphere affects signals from global positioning system (GPS) satellites high above the surface. This technique is called radio occultation and measures the bending of the GPS signal in the atmosphere. The observations offer scientists very accurate information to improve weather forecasts, especially for tropical events such as hurricanes. COSMIC also helps scientists monitor a part of Earth's upper atmosphere called the ionosphere and provides long-term records for understanding Earth's climate. This video is part of the UCAR Center for Science Education's Satellites and Weather Teaching Box.